It was an enjoyable week for fans in Edmonton, but not necessarily for 14 of the teams participating. Four years of hard work, practice, travel, and time away from family and jobs, all culminated into one intense week of curling. Ultimately only 8 remaining players (ok, 10 if you include the 5th man/woman) experienced the thrill of victory. The remaining squads are left to wonder what could have been. Speaking of the 5th position, will the CCA approve of the current extra teammates? Will the teams keep them or toss them aside? Does it really matter? Not for me to ponder I’d prefer to look at specific games and some of the decisions made throughout the week. Ferbey was 9-7 against Howard going into this game and needed a win to ensure their game against Koe Thursday night would have play-off implications. 5th End: Russ Howard (commentating for TSN) questions Ferbey’s decision to come into the rings on David’s last shot. A valid point and Randy’s squad is fortunate to get away with only giving up a single. At this stage, Ferbey is up 4-2, Howard has last rock. If the freeze attempt by Nedohin is perfect, Howard is likely forced to one. He could attempt a difficult double raise but more likely may try a delicate draw to the edge of the button avoiding the corner guard on the in-turn. Most likely Howard gets one and Ferbey is up 4-3 with hammer and 5 ends to play. In this situation his Winning Percentage (WP) is 80%. If Ferbey instead throws a guard, he could cut-off Howard’s in-turn draw and make it difficult for him to get two. Glenn would have to play an out turn and try to catch half of the four foot. If we assume Glen makes his deuce 100% of the time, game is tied and Ferbey’s WP = 61%. If Glen gets three or four, which was possible given where David’s rock ended up, Howard’s WP is either 60% or 75%. Ultimately Ferbey is trying to gain Dominant position (80% or greater) rather than stay in a close game (<66%) at the risk of putting Howard in Control (>66%<80%). I’ll spare everyone the formula (let me know if you’re interested), but Dave needs to make this corner freeze roughly ½ the time for the call to be correct. 9th End: Alan Cameron may have misquoted me slightly in his article: (http://communities.canada.com/calgaryherald/blogs/curling/archive/2009/12/12/numbers-favour-martin-in-final.aspx). What perhaps I meant to say was “if you agree with Randy’s assessment of David’s chance to make that shot (4 or 5 out of 10) then it is the correct call”. Alternately, if you agree with Russ Howard’s assessment of Dave’s chances as 10%, then it is not. How often does he need to make the shot to make it the correct call? If Ferbey takes one, WP = 25%. Taking stats exclusively from Grand Slam events show this number is closer to 20%. This is the only significant difference in numbers we see from Grand Slams versus all events. We’ll use 25% for now. Let’s chose z as 10% and s as 5%. Solving for x = .246 or approx 25%. If we assume s is 0 and z is 20% it only increases to 27%. Giving up a single or a steal of two to Howard has minimal difference in the probable outcome. If we also think our chances of stealing in the 10th end is less than 25%, we are even more inclined to try the double. If we think we will only steal 20% (similar to Grand Slam numbers) then x = 14% or 16%. This is still above Russ Howard’s estimate, but well within range of Randy’s. In the 9th End, Koe, trailing 5-4, is faced with a similar decision as Ferbey was in the previous example. 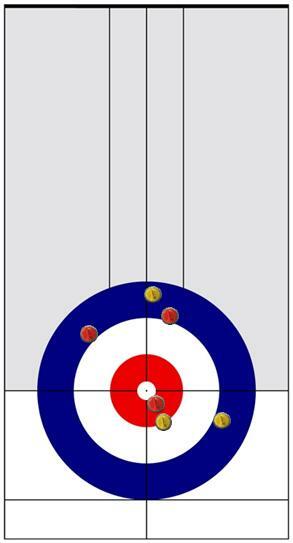 Rather than draw for his single, Koe elects to play a soft out-turn take-out around the guard in front of the rings. It’s an attempt to score two but a miss results in a steal. No steal of two here, and perhaps some small chance his draw for one would be missed (needed full four foot). The hit he played could also possibly result in a single, but very difficult given that they were pushing shot stone towards the button. I’ll leave the calculations up to the reader, but appears their chances for two needed to be close to Nedohin’s in order for it to be the correct call. Easily the most entertaining 7-2 game I’ve seen in a long time. 3rd End: Koe is up 1 without hammer. There is a single tight corner guard way out on the wing. Koe attempts a draw around on his first rock and comes light, leaving two stones staggered. Jason decides “because it’s the 3rd end” to draw to the open. The end is blanked. This is simply a case of over thinking a philosophy which I’ve heard before about “scoring in the even ends”. I even discussed some of this in my article from February 2009. In it, I discuss the 5th and 8th ends. Notice the 5th end is an odd numbered end; however in that article I argued preference to have the hammer. A score here by Jason and a Koe score in the 4th gives Gunner hammer back in the 5th. An example: If Jason scores 2 here and then forces Koe to one in the 4th he is tied with hammer entering the middle game (5th end) and has 61% WP (Close Game). If Jason scores two in the 5th, his WP = 75%. If he waits to the 4th and holds Koe in the 5th, his WP = 62%. If he then scores two in the 6th, his WP increases to 79%. Interestingly enough, this is a .04 difference and shows Gunnlaugson does gain if scoring a deuce in the 4th instead of the 3rd. However, both are still in what I define as Control and not a Dominant position. And the overriding factor is, there are too many “IFs”. Solving for x = 18%. Bringing a possible steal into play, we could estimate Jason needs to make his deuce more than 20% of the time to make the attempt at a deuce correct. These WPs are also based on average numbers and I’ve stated before that the more ends remaining, the greater disparity from the average for teams of unequal strength we can expect. We can assume that Koe is a stronger team; however we can still compare the values and determine which decision leads to a better outcome. The only possible argument to be made is that with fewer ends remaining, the result will be closer – but it is only one end less so it is not significant enough to sway our decision. For example, if you are a weaker team and win the toss, my theory would indicate your best chance may be to blank 9 ends and then be tied with hammer in the final end. This eliminates the chance your opponent will can use their superior skill during the many ends available to score multiple points. With free-guard zone however, this is simply not possible. At any stage your opponent can force you into a non-blanked end. 5th End: I’d nominate the 5th end in this game with the 9th end in Howard vs. Middaugh for “Best Ends” of the week. See image which shows the rock placement before Jason’s first stone. There were multiple calls which could be argued several ways and all opinions could likely be supported. One thought I’d like to bring up was Jason’s comments heard on CurlTV of a “big end” vs a deuce. Should they position for a “big end” or try for the deuce? I won’t even begin to analyze the possibilities based on rock position, etc. Have fun if you like. In general, I like Gunnlaugson playing for a big end based on the fact that he expects his opponent is stronger and the positioning of the rocks are such you may be able to take some risk and put the game back to Close or with a 4, take Control. If I’m the stronger team I would be more inclined to take my deuce and use my skill to create opportunities in the last half of the game. Unfortunately, Jason wasn’t able to make the big shot or place the rocks correctly to get the big end. Hats off to Kevin Koe who made a brilliant shot on his last to take away most of Gunnlaugson’s options. Martin is up 6-5 with hammer in the 9th End. On John Morris last rock Kevin Martin elects to keep the centre guard and play into the rings (see image). Why doesn’t Martin peel the guard here? If Kevin takes one or blanks, he leaves Koe with an 11-12% chance to win. If Koe steals it goes up to 20-25%. If Koe steals 2, as unlikely as it would appear, Koe now wins 60%. “If I peel twice, Koe will hit on his last rock. I’ll face three and have to play a double and likely give up a steal. If I play into the rings now, I at least give myself some chance to score and it is doubtful Koe could steal 2, which is my primary risk”. During the CurlTV broadcast I questioned the call, preferring to peel. In retrospect, you can make a good argument for both decisions. Wayne had a tough week. His first three games were Ferbey, Howard then Martin. He needed to come out of those three with at least a win but never got any momentum. The Howard game was a close one which could have gone the other way. 9th End: The 9th end was (along with Gunnlaugson vs. Koe 5th end) my vote for most exciting end of the event. It lasts nearly 25 minutes! Check it out at http://www.tsn.ca/curling and link to Video. Howard is up 5-4 with hammer and elects to leave the long guard. This gets them into some trouble and they nearly give up a steal of two. See analysis above in Koe vs. Martin and think if a similar decision comes into play for Glenn at some point in the end. Clearly the best game of the week. Unfortunate the final didn’t live up to the re-match we’d have wanted. 8th End: Martin is tied 5-5 without hammer and elects to play his first rock in the rings rather than play a centre guard. I wrote about this in several previous articles, including January 2009. Kevin is still the only top skip I’ve seen make this play. Martin’s final shot in this end was the shot of the week. Facing a 2 or possible three by Howard, Kevin makes a fantastic hit and roll, corner freezing to his own stone. Howard still has a raise for a multiple score but it is much more difficult and he is held to one instead of the game being possibly over. Because it’s tied in the 8th end, Kevin knows that whether Howard scores a two or a three it has little bearing on the outcome, they will likely lose the game. What is interesting in this scenario is both the ability to visualize the shot and the dynamic between John and Kevin. At first Kevin didn’t like the out-turn. John was able to maneuver the conversation and ease Kevin into the decision, without challenging him. It is generally accepted that you don’t want your skip playing a shot he or she is not comfortable playing. This discussion captured parts of the game that are critical to success and can’t be simply analyzed by numbers. My blog focuses almost exclusively on Item 3. This is an example of item 4. In these cases, teammates become like a caddy who is discussing which club to play on an important shot. It’s not always about which club is correct but about how the caddy interacts and builds confidence in the golfer. These areas are ranked by what I would consider level of importance, although top teams are generally strong in all areas. 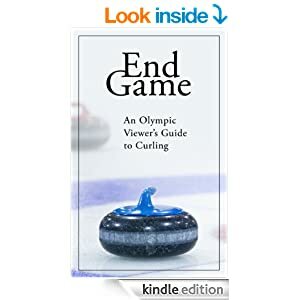 If you’d like to review video from any of these games or others, check out http://www.curltv.com/ or http://www.tsn.ca/curling and click on Video. Yes readers, yours truly, the Curl with Math guy (perhaps a better moniker would help my marketing efforts), will be joining Luke Coley in the broadcast booth for several draws during the Roar of the Rings! Actually, I prefer the name “Olympic Trials”, as it more clearly states what is actually going on. ROTR seems to be a screenwriter’s pitch to Warner Brothers for a new movie…. “Lion King meets Lord of the Rings….and we’ll film it in Edmonton; parts of it look just like Mordor and the locals look like Hobbits”. The “Big Four” are Martin, Howard, Ferbey and Stoughton. No slight to Middaugh, who is a two time Brier champion or Koe who is an original 4 qualifier, but those four teams have the most wins, best records and greatest success against the field going back many years. It would not be a surprise if any of these teams won, and the numbers will show us why. Kevin Martin is 76-35 (68%) since start of the 06/07 season against this field and is 41-19 (also 68%) against the rest of the Big Four. Howard is 13-13 against Martin and 7-8 since 06/07. However, they are also .500 against the others in the Big Four, 31-31 overall and 17-17 since 06/07. Martin has outscored all Trials teams by nearly a point per game. Howard and Ferbey are around a half point. Martin is 22-18 against Stoughton historically but 11-2 since the 2007 Brier. Martin is 20-7 against Ferbey since 06/07 and 27-10 overall. Howard is 12-5 since 06/07 (70%) and 25-14 historical numbers against his ex-teammate, Wayne Middaugh. Ferbey is only 16-29 (36%) since 06/07 against other Big Four teams but minus Martin, they are 9-9 against Stoughton and Howard since then and 21-17 overall against those two teams. Stoughton is 80-74 against the entire Field but has beaten Gunnlaugson (including Carruthers) 10 times. Jeff is 37-46 overall against the other Big Four teams including a mere 13-22 (37.1%) since 06/07. As a top 4 qualifier Koe has a (somewhat) easier start, not facing Howard, Martin or Ferbey until their final three games. Their opening game is against Simmons, against whom they are 11-0. They are 7-6 vs Stoughton but against Howard, Martin and Ferbey they are 18-41 overall and 18-37 since 06/07. Middaugh plays Martin well (11-12 and 4-4 in last 3 years) but Howard (see above) and Ferbey (4-11) both seem to have his number. Middaugh is 7-0 vs Carruthers/Gunnlaugson. Gunnlaugson has no chance, mathematically. But then again, Gushue probably didn’t have much chance last time either, even Stoughton said so…. With their small sample size, we don’t have much to analyze. Including Carruthers, Daley Peters and Gunnlaugson as skipping the squad is 12-37 against this field. However, Gunner is 3-5 as a skip and has beaten Howard, Koe and Stoughton. If only he’d picked up a veteran to play front end…. Let’s examine chances of outcomes. These are based on handicapping analysis I have done. I will spare you the details of the numbers, other than to say if you’d like to bet on any games, please let me know. Martin has 7% chance and Howard a 4% chance to go undefeated. At least 5 Wins – Howard is around 54%, Martin near 65%. Next closest is Ferbey at 32%. Gunnlaugson is calculated at approximately 7% chance at 4 Wins. As I stated earlier, this is based on small sample size and with other skips, so if someone offers you better than even money that Gunner will win 2, then it is a good bet. Of course, he still might go Winless (12% chance). The Women’s Trials teams have the Big Two but also 3 others who are very close. Jones and Lawton then Scott , Bernard and Kleibrink. Let’s call them the Top 5. Jones is 39-23 (63%) and 29-21 against the other top 5 teams. She is 8-1 against Bernard, 4-0 against McCarville but 6-9 against Scott. Heads up Jones edges Lawton 6-5. Scott is 33-30 against the other Top 5 and 12-5 against Bernard. Interestingly, she’s only 2-5 against Holland. Kleibrink is only 41% against the other Top 5 and, though 10-9 against Scott they are 7-3 in the last 10 meetings. Bernard is 40% against the other Top 5. Strong against her Calgary opponents: 8-4 against Kleibrink and 6-0 against Webster. McCarville’s numbers are close to Kleibrink, Scott and Bernard. They are 46% against this field while the others are 48-50%. However, her sample size is much smaller and we can expect her success at this level of competition is not on par, so we will put her in this category (so that we have someone!). Webster played well at the Pre-Trials, qualifying in A, but historically they are 10-24 against this field. It’s not likely, but if given the right odds, some would say it’s good to bet a streak. Holland is 16-27 against these teams but is 5-2 versus Scott. Being the last qualifier they have a tough start but who knows…. Jones has a 6% chance and Lawton a 4% to go undefeated. At least 5 Wins – Jones is 59%, Lawton is 50%. Next closest is Scott at 25%. At least 4 Wins – Jones is 84%, Lawton is 78%, Scott and Bernard 53%, and Kleibrink (50%). McCarville has a 47% expectation for 4 wins and Holland is 25% likely. Webster is 11% likely to get 4 wins and 9% likely to be Winless. Howard, Martin, Ferbey all get in the play-offs. 2006 was an anomaly and these guys are all more prepared and playing better against the field coming in than they did in 2006. I think one or two others may also be in tie breakers, likely Stoughton and possibly Middaugh – but he needs a good start. Koe has a chance to get on a roll with some early wins but will need to hold on. Simmons had a good Pre-Trials but they may get called for too many men on the ice. I think if Gunner goes 0-7 its possible to have a 6-way tie at 4-3. Wouldn’t that be something? Women’s? I don’t watch/study this game as much and think anything is possible. Many of these teams have the big game experience and should be able to play to their potential despite the magnitude of the event. The qualifying format through a Pre-Trials likely helped teams like Webster and McCarville in this regard and make them possibly more dangerous than some would suspect. Note: the accuracy of these records is the responsibility of CurlingZone. We may be out by a game or so, but we have to start somewhere. If anyone has numbers which contradict these, please e-mail Dallas or Gerry @ CurlingZone.com. Another note: These numbers don’t rank the value of a win based on the importance of the game. For example, a win or loss could come in the Brier or in the opening round of a WCT cashspiel. We could try to add this to our analysis, but I do have a day job and I don’t know how much more value it gives us. PLEASE, PLEASE, PLEASE…will PinnacleSports or some other betting web site offer the Canada Olympic Trials? Four years ago some great gambling opportunities and the Brier last year was a potential gold mine. And finally, this year, I do all the prep, analyze the records, am prepared to lay down my money….and no where to put it. Guess we’ll have to wait for Vancouver…. There should be no surprise that I agreed with Bill Belichek’s call on 4th and 2 versus the Colts a few weeks ago. For anyone wanting math analysis in Football, check out http://www.advancednflstats.com/ and their coverage of that controversial decision at http://www.advancednflstats.com/2009/11/belichicks-4th-down-decision-vs-colts.html. Of interesting note is how talking heads (of which I will be one next week) try to attempt to support their belief regardless of the actual numbers. Tony Dungy said that Bill “should have gone with the percentages” and punted. Actually Tony, percentages say the opposite. The following weekend on ESPN Sports Reporters, Mitch Albom of the fine quaff and author of such books as Tuesday’s with Morrie, Five People You Meet in heaven, and other books which can be made into an ABC Hallmark movie of the week, said “No, it’s one of those things that if it works it’s the right call. It didn’t work and every single number out there that you can crunch says it was the bad call.” What? Troy Aikman this past weekend mentioned, while commentating on my Vikings, that coach Brad Childress should be concerned that Favre has only thrown 3 interceptions this year and he is likely due for a bad game where he will throw 4 or 5. We hear nonsense like this all the time in baseball when the announcer says “he’s 0 for his last 5 at bats, he’s due for a hit here”. These examples are similar to stating that if a coin comes up heads 9 times then it is more likely to come up tails on the 10th attempt. I hope my readers have figured out that is not the case. If you happen to be at the Trials in Edmonton and read my articles, whether you agree, disagree or really don’t care, please come say hello. I’ll be the person in the CurlTV booth most likely to be fired. Notice that if the end is blanked, TC has a 24% chance. At the beginning of the 6th they had a 22%. In fact, their odds get slightly better if the end is blanked. If they play aggressive and steal, they increase their chances to 40%. Holding Ontario to one is 22%. In fact, a blank appears to be 2% better than actually forcing Ontario to a single point! It appears the risk of attempting a steal at this stage is not necessary. What about in the next end? If it had been the 7th instead of 6th end, the decision is very different. Now, entering the 8th end when 1 down without hammer, the odds are only 18%. Holding Ontario to a single gives a 21% chance. A steal in 7 instead of 6 still leaves them 40% - no change. It would be more tempting to play the final rocks aggressively if it were the 7th end. If the 7th were to be blanked and TC is one down without hammer playing 8, it is imperative to either score a steal or force opponent to a single. When entering the final two ends 1 down without hammer, a teams chance drops to 16% - but more importantly, a steal in 9 gains less. A steal in 8 would produce a tie and a 39% chance, but a steal in the 9th to tie the game is only 30%. Recall my previous article on Early, Middle and End Game. The Early Game is the first 4 (or 2) ends. At this stage, most top teams will play aggressive attempting to take control or dominant control as soon as possible. In the End Game (final 3 ends), teams will play the scoreboard more closely, attempting to be tied with hammer or two up without hammer in the final end of a close game. So what is Middle Game Strategy? Middle Game is the 5th through 7th ends in a ten end game (or 3-5th in an 8 end game). Recalling my previous description, statistical changes start to appear in the middle game. Trends appear for each situation (tied with hammer, 1 up without, etc). So what are some considerations when determining our Middle Game Strategy? The first decision is whether to continue aggressive play. This is usually the case early in each end, but as the end develops a team will choose shot calls based more on scoreboard and ends remaining before the End game. So to start discussion on Middle Game strategy, let’s start by examining which scenarios are more favorable in the End Game. I will use a 10 end game from now on, the reduce complication. To transfer this analysis to an 8 end game, just subtract 2. In the 9th End, one down with hammer is a disadvantage greater than any other point in the game. In fact, only the scenarios starting the 9th and 6th ends have tied without hammer the same (less than 1%) as one down with hammer. In all other cases, one down with hammer is preferred position. If we have the hammer in a close game the ends previous (5th and 8th), it allows us to take some additional risk with less penalty for being forced to a single point. Recall a Close game is one in which a team is down one with hammer anytime or tied prior to final two ends. In the 5th and 8th ends we can aggressively play for two or three and if we are forced to one, our chances are actually the same as if we had blanked the end. If we instead are one down with hammer in other ends, if our aggression results in being held to one, we are worse than if we blanked the end. Conversely, forcing our opponent to one in this situation (5th or 8th end) gains no advantage over blanking the end. The risk of playing aggressive to force our opponent to one, which may result in a deuce, provides no advantage – a steal is required to gain any advantage. Stealing in the 5th puts us at a 76% winning probability (Control). Stealing in the 8th an 85% chance (Dominant Control). Blanking 5 and then stealing in the 6th in fact gives us now an 80% chance. I’d suggest a sensible play is to tempt our opponent into blanking the 5th end and force our position without hammer in the next end. Blanking the 8th was discussed in our last article and is more open to debate. If we force our opponent to a single, we again gain no advantage to blanking. However, a steal is a significant advantage over our current position. For the 5th end, in our previous example (one up without) a steal takes us from a 61% chance to 76%. If we are tied and steal, we move from 39% to 61%. Using our analysis from the last article, switching from 39 to 61 is 50% better, whereas 61 to 76 is only 25% better. For the 8th end we go from 34 to 65 (91% better). It would appear we are more inclined to attempt to steal in this scenario. However, stealing is always difficult and we risk our opponent making a multiple score. We are forced to be more aggressive because of our position but being one down with hammer gives us an ability to be aggressive without the same risk. Being forced to one in the 5th or 8th end is no mathematically disadvantage. In all other ends, being held to one is a disadvantage over a blank. Again, per situation one down, we can be very aggressive at the risk of being held to one. However, as pointed out above, a steal is very bad for us in this position. In fact, a steal is very bad for us every time in this position. It is most critical in the 9th where we drop from 74% to 38%. In every case, having hammer appears to be a greater advantage in this position. We can be aggressive without any risk of being “held to a single” as it is virtually no different mathematically from a blank. So…what is our finding? In a close game, we’d prefer to have hammer in the 5th and 8th ends. We may in fact make decisions in the ends previous which will force this situation. For example, if we are tied playing the 4th with hammer and have an opportunity to blank, we are more inclined to take this route. If we are one up in the 4th or 7th, we should force our opponent into scoring, even at the risk of a deuce, in order to have hammer in following end. Eight end games become interesting because the advantage exists in the 3rd end. 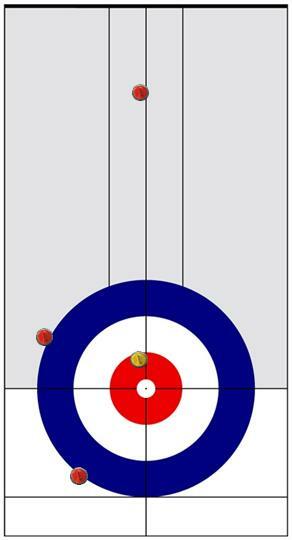 A team may even choose to tempt a blank if they are without hammer in the first end, to force their opponent to score in the second end, in order to have hammer in the third. This seems drastic and I’d suggest the advantage is not significant enough to “drop an end”. But further analysis might disprove my initial thinking. Some readers may have noticed that there are two ends between the 5th and 8th. This means, without a blank or a steal, if we have hammer in one of these ends, our opponent has hammer in the other end. For example, say having hammer in the 5th when one down results in a deuce. We are now one up. If our opponent is held to one and then we are held to one, we are now one up without in the 8th end. However, if our opponent ties us in the 6th and we instead manage a blank in the 7th, we are now tied in the 8th with hammer. I would not suggest this analysis should be a factor in how a team begins play in and end. The modern game does not allow a team to force a blank end at will. However, as an end develops we may be more inclined to “bail out” of certain ends in order to better position us in ends where we have greater advantage with hammer in a close game.